The fabulous brand Deep heat was launched in 1951 - aimed at targeting muscle pains and strains it is now huge brand that most of us know and love. 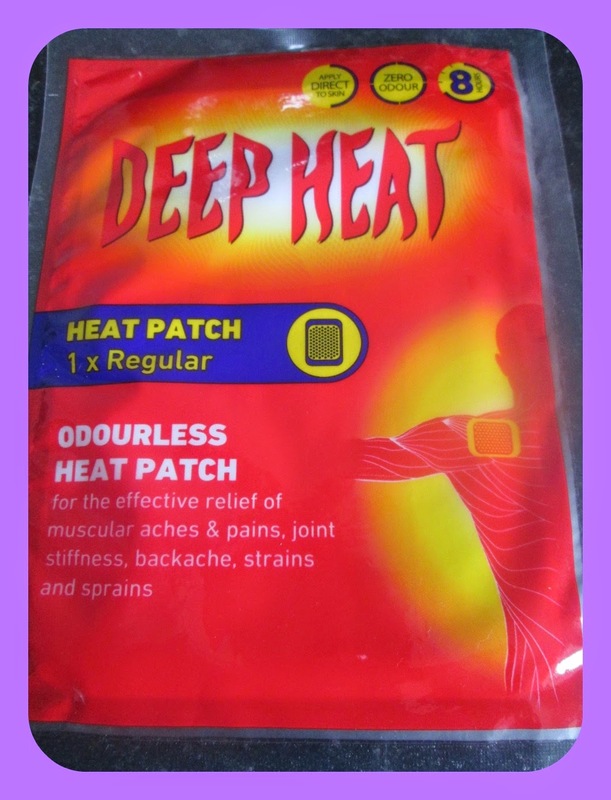 I have been sent one of the newest products from their range its a deep heat odourless patch, unlike the other patches in there range this one has no scent and is colourless. "Deep Heat has been handed down by generations as the go-to remedy to provide fast, effective relief for muscular aches and pains, joint stiffness, backache, strains and sprains. Deep Heat works on several levels. As a counter irritant it helps dilate blood vessels and relaxes muscles, while its warming action triggers sensory signals which damp down discomfort by flooding pain pathways with competing sensory messages. It's a trusted brand where it’s soothing warmth has become a staple in first aid kit bags to provide relief from muscular aches and pains". John Miles, head of medical and phsyio services at Cardiff Blues, offers his top tips on using heat therapy to prevent and treat muscular and ligament aches, sprains and pains. For muscle injury prevention – For those people who suffer with stiff hamstrings, calves or lower back pain when exercising, the application of Deep Heat over the muscle prior to exercise can be a great benefit in stimulating blood flow and therefore reducing muscle soreness and potential problems. Returning from injury – When returning from injury, particularly concerning muscle issues, the site of injury can often remain stiff for a while. Applying Deep Heat over the general area will immediately warm up the area bringing blood flow and oxygen back allowing normal movement to resume again. This speeds up the body’s ability to recover normal full function again. Cold weather activity – Whether you are preparing for a light run or a day in the garden, it’s important to get warm and remain warm while carrying out your activity to avoid and relieve muscular stiffness and cramps. A great tip for keeping hands warm when out in the cold is to apply Deep Heat to the back of the hands as this will stimulate blood flow to the area and in doing so keep the hands warm. Cramping – For those who suffer with cramp either when running or just in general day-to-day life may find benefits from applying Deep Heat over the main muscle area of the calves, or where cramp tends to appear for you personally. This will improve the circulation to the area and keep a fresh supply of blood in the muscle. As you can see by the tips above deep heat can be used in a variety of different ways, and by using it in the correct way Deep heat is very effective for the relief of muscle aches pains, joint stiffness, backache, strains and sprains. 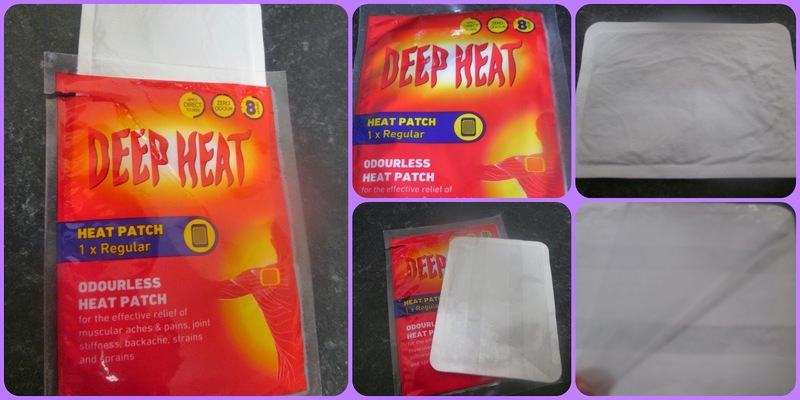 The Deep heat patch comes as a convenient size easy to pop into your bag so if you are suffering with pain, you know you always have one handy. Before use make sure skin is clean and dry, free from broken skin, bruises or swelling. The patch will heat up five minutes after applying and will remain warm for up to eight hours. To remove slowly peal off the patch. The patch really has no scent to it what so ever, it is quite heavy in weight meaning you can really feel where it is positioned underneath your clothes but once it has been fixed in place a while you do forget that it is their. The patch does get quite warm but it wasn't uncomfortable, the warmth for me made it quite soothing, I found that when the patch was peeled off it did leave a slight redness but their was nothing untoward and I thought it really helped with my achy hip that I always seem to have if I have been doing a lot on my feet, or a lot of walking. The patches are priced at £2.07 for a single patch and £6.25 for a box of four, also available are a larger size targeted at back pain these are priced at £4.47 for a box of two all of the options are available to buy from boots.com . * I was sent a Deep heat Patch for the purpose of this review all opinions remain honest and my own.